The US-Ireland Top 50 Companies luncheon is part of the annual New York - New Belfast conference. It celebrates companies with high performing transatlantic business operations between the US and Ireland. 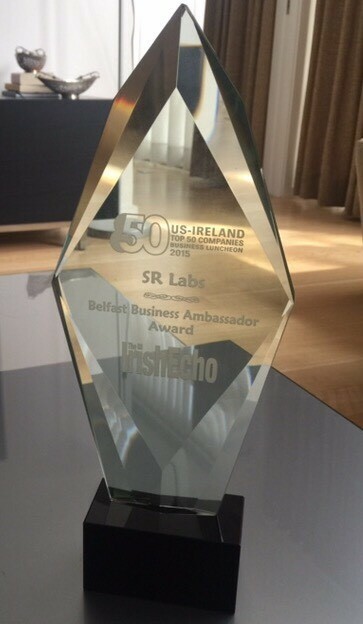 SR Labs were honoured to receive the Belfast Business Ambassador Award at the event, a special recognition award only received by 7 of the top 50 companies. This special reconigition award marks the ongoing success SR Labs has had since it acquired the Wombat business in July 2014, and is the result of a lot of hardwork and dedication from the entire team over the last number of months.